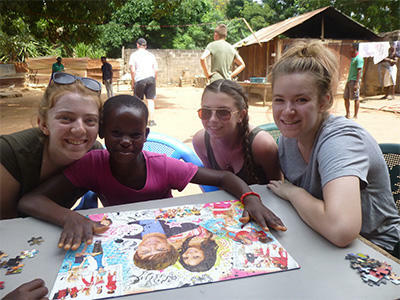 This summer, Ackworth School embarked on their third trip with Projects Abroad and second trip to Ghana! Their enthusiasm, generosity and compassion to volunteer is truly evident through all they have achieved, it was tremendous to have them on board for another unforgettable and enriching experience. During their two week project they embarked on their placement at Rising Star orphanage where they built an impressive toilet block of six individual toilets, as well as teaching the importance of personal hygiene. This will have a huge long lasting difference on the children’s quality of life. The children’s vitality, smiles and laughter was infectious and fueled the energy of the group during the physical days in the high temperatures. 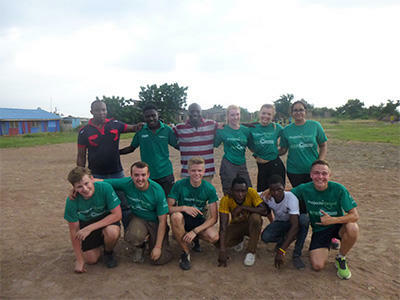 The group learnt local games with the children, played football and shared a love of dancing alongside helping the children with their numeracy and literacy skills. The football match sure did bring everyone together and unite the group, amazing what a universal sport can do! 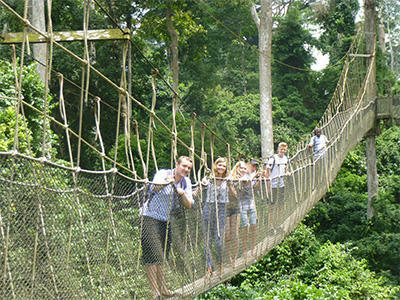 On the weekend, the group journeyed to Cape Coast to experience the rainforest canopy walk of Kakum National Park and visited Cape Coast Castle where they learnt about the local history. The group also took part in a local drum and dance lesson where they discovered new rhythms and dance moves, great to bring back to Ackworth. "My Projects Abroad experience is something I’ll certainly never forget! From being greeted upon arrival by our amazing mentors to having an emotion farewell with our friends at the Rising Star orphanage, every moment was a blessing. Although it was a lot more physically demanding than I’d initially expected, our hard work made the finished toilet block so much more rewarding. The children at the orphanage were THE BEST! Whether learning, playing football or dancing, they did nothing but laugh and, thanks to them, my African dance moves aren’t too shabby! From this trip I’ve come to realise a little effort means a lot and you don’t know happiness until you spark it within others!" "One of my favourite parts of this trip was meeting all of the children and people here who have all been so welcoming and kind. They are all so happy, especially the children and it is infectious. I especially enjoyed the local biscuits and the meals at our homestay were really nice; I am particularly fond of yams!! However eating rice twice a day for two weeks did become rather boring. Building the toilet block was very hard but also very enjoyable as it is something I’ve never done before. I especially enjoyed what we did at the weekend, particularly when we went to Cape Coast to do the rainforest canopy walk and visit Cape Coast Castle. One of the biggest challenges was coping with the heat. One of my favourite things about Ghana is the water bags, they’re very fun to drink out of and it will take me a while to get used to bottles again!" "Ghana was an incredible life experience that I will never forget. The first thing I noticed on arrival was the happiness and friendliness of the people and how infectious it was. We completed the project of building 6 individual toilets for the orphanage and were able to teach the children the importance of personal hygiene along the way, although their knowledge already was quite impressive! One of my favourite parts of the trip was on the second day when we took a football to the orphanage and we managed to start a massive football match where nearly everyone got involved. It was amazing to see such a simple sport that I love bringing us closer to kids and I knew it would be a moment I'll never forget. And lastly I didn't think I could talk about Ghana without mentioning the food! The number of different ways to prepare rice, each tastier than the last, was incredible. The best was definitely Joloff rice and it will be one of the many things I will miss about Ghana and will make me want to go back at some point in the future!" 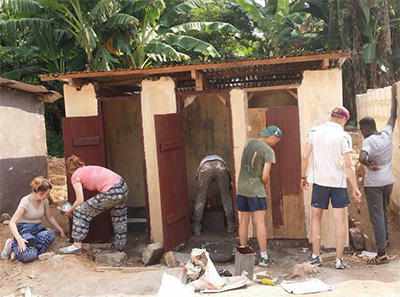 "Going to Ghana with Projects Abroad has to be one of the most rewarding things I've done and, although building the toilet block was hard work, it was fulfilling to see it finished in the end. Everyone we met in Ghana was so friendly and they made us feel so welcome during our stay. My favourite part of the trip was learning and playing the local games with the children at the orphanage. I also enjoyed reading with the children and helping them with their numbers and shapes. In the weekend, we went on a canopy walk through a rainforest and we got to see the amazing views there from a whole new perspective- it really was beautiful. We also went to visit Cape Coast Castle to learn a little about the history of empire and slavery in this region. 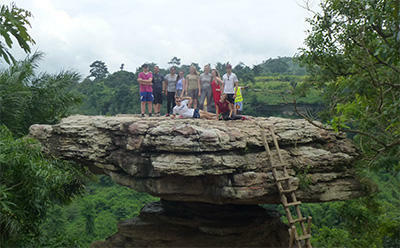 I can honestly say that I have enjoyed the trip and that I would recommend volunteering to all those who ask about it. " "The trip to Ghana was possibly one of the most rewarding things I've ever been involved with. Not only did I grow as a person and become more thoughtful, grateful and culturally aware, I helped other people have the chance to grow too. I loved every part of the trip, especially the realisation that we have genuinely helped several people have a better quality of life and a better foundation to reach their full potential. My favourite part of the trip was spending time with the people at the orphanage and getting to know them. This allowed me to not only have fun with the children but to make friends with people I would otherwise never have had the opportunity to meet. Although the work was hard and tiring, I still enjoyed the experience, and the sense of satisfaction when we finished was unbelievable. I already miss the people and the friendly atmosphere and I would love to go back there, hopefully very soon!" 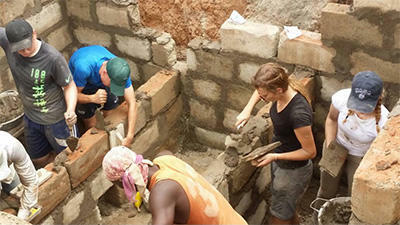 "While spending two weeks in Ghana with Projects Abroad, I was able to build a toilet block for an orphanage, and meet the lovely children who lived there and teach them English and Maths. We stayed at a local home and were able to eat local dishes for our meals which were very different to our own, they were also quite spicy. We went on a hike in the rainforest at the weekend which I enjoyed very much, I also enjoyed our drumming and dancing lesson with a local group, as I have a passion for dancing so it was fun to see how different cultures dance. I also had my birthday in the first week while we were there and everybody made it really special for me. It is a memory I will treasure forever." 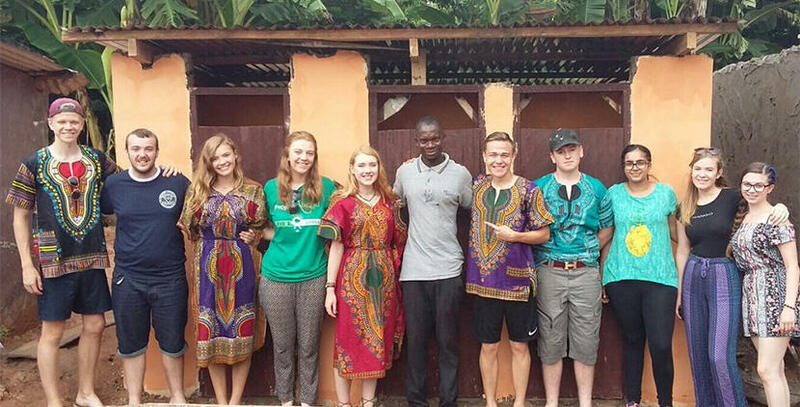 "The Projects Abroad trip to Ghana over the summer was unforgettable. One of my personal highlights was trying different foods that we had never even heard of before! As well as this I thoroughly enjoyed the football match against a local team which ended 1-1. The trip helped me develop team-work skills as we had to work really hard together. The sense of achievement after we finished the project and delivered the hygiene presentation was well worth the effort and the memories from the trip will stay with me forever." For more information on volunteering as a group in Ghana, please click here. Otherwise, please follow the links if you would like more information on volunteering as a group on a Care & Community project or a Building project.